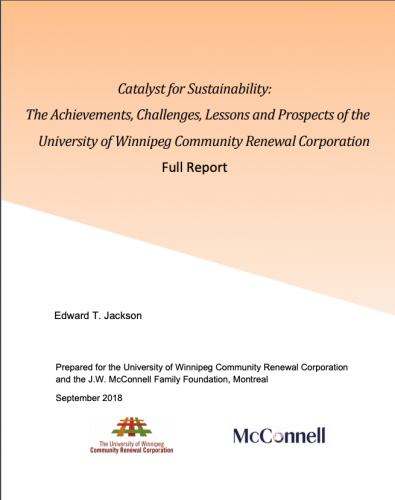 This report summarizes the experience, models and tools, results, challenges, lessons and prospects of the University of Winnipeg Community Renewal Corporation (UWCRC). Established by the University of Winnipeg’s Board of Regents in 2005 as a special-purpose entity to implement the University’s growth and sustainability plan, UWCRC is a separately incorporated non-profit, charitable corporation with its own Board of Directors (eight members from the University of Winnipeg (UW) and eight from the broader community) and staff. The University of Winnipeg President chairs the Board. In 2016, it launched UWCRC 2.0 Inc., chaired by a community representative, as a new vehicle to extend its services to other post-secondary institutions, non-profits and cities in Manitoba and elsewhere. Both UWCRC and UWCRC 2.0 Inc. promote four pillars of sustainability: environmental, social, economic and cultural.